The prince will visit in November as part of a tour aimed at "strengthening relations" in the region. Prince Charles is to make an official visit to Bahrain in November despite the escalating human rights crackdown in the country. This endorsement comes after Queen Elizabeth sat next to the king of Bahrain at her 90th birthday celebrations this summer. 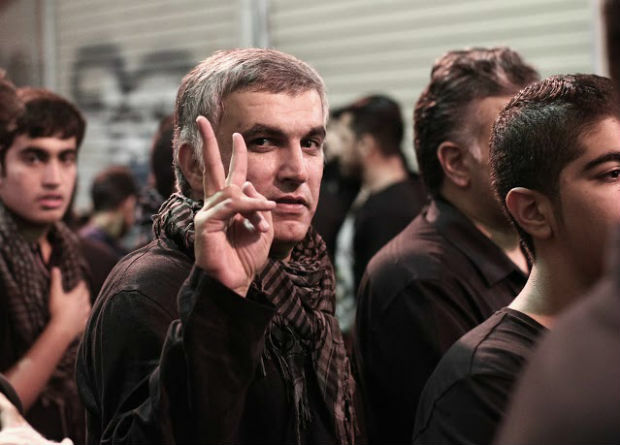 Human rights campaigner Nabeel Rajab, who has been arrested multiple times because of his peaceful activism, has been detained since 13 June for comments he made on Twitter. Charges brought against him for his tweets, and even retweets, include spreading “false or malicious news, statements, or rumours”, “offending a foreign country” and “offending a statutory body”. Rajab was also recently charged with “defaming the state” after a critical op-ed he wrote appeared in The New York Times. Just last week, the UK government was urged by a group of 50 NGOs to put pressure on Bahrain over Rajab’s treatment. With news of the state-sanctioned Prince Charles visit, it appears these calls have of fallen on deaf ears. Rajab is expected to be sentenced at his next court hearing on 6 October. He faces more than 15 years in prison. The Bahraini government has repeatedly used prison as a weapon to silence its critics. Opposition activist Zainab Al-Khawaja was sentenced to three years in prison in December 2014 for “insulting the king” after she ripped up a picture of him. Though she has now been released, her father Abdulhadi Al-Khawaja, a human rights activist and a member of the Bahrain 13, remains in prison along with over 3,500 other prisoners of conscience. On 22 June 2011 a military court sentenced all members of the Bahrain 13 to between five years and life in prison, on trumped-up charges of attempting to overthrow the regime, “broadcasting false news and rumours” and “inciting demonstrations”. All but two of them remain behind bars. Last year, the Liberties and Human Rights Department of Al-Wefaq National Islamic Society recorded a total of 1,765 arrests by security services for reasons related to the opposition political movement, including the detention of 120 children and five women. Another abusive tactic used by the government of Bahrain is to revoke the citizenship of many of its critics. This is illegal under several international agreements, including the Universal Declaration of Human Rights and the International Covenant on Civil and Political Rights. Regardless, 208 Bahrainis were rendered stateless in 2015 alone. Since amending its citizenship law in 2014, Bahrain’s judges can strip citizenship from anyone convicted under anti-terrorist laws. However, the law does not properly define “terrorism” and several of those subjected to this fate in 2015 were convicted under vague terms such as “inciting and advocating regime change” to “defaming brotherly countries”. Most of those rendered stateless have been deported, along with their families. Named by Reporters Without Borders as an “enemy of the internet“, Bahrain has been busy clamping down on the web over the last few years. Despite being one of the best-connected countries in the world from a technical perspective, Freedom House gives the country an online freedom rating of 72, with 100 being the worst possible score. The government is also working on a new Russian-inspired default search engine that would allow it to filter results without the cooperation of Western-based companies such as Netsweeper, which was exposed by the Associated Press as a facilitator of Bahrain’s censorship program. Kieran Etoria-King is editorial assistant at Index on Censorship. He graduated from Liverpool John Moores University in July 2015. He is the 2016 recipient of the Liverpool John Moores University Tim Hetherington Fellowship. He has previously written for The Independent and The Voice.